You step out of the car, zip your jacket, and sling your daypack over your shoulder. The sun on your face feels surprisingly warm as you walk toward the line of willows that separates you from your destination: the tallest sand dunes in North America. Ten steps later you emerge into a vast, sandy landscape dominated by dunes, mountains . . . and you. As you look north, you see a coyote following a trail with its nose. You notice deer tracks in the sand at your feet, hear the sound of rushing wind, and look up to see a raven just overhead, flapping its wings to catch a breeze. You wonder: am I all alone here? Happily, you're not. The visitor center is open and staffed by park rangers almost every day of the year, and the campground is open all year. Winter weekends see a steady flow of park visitors. But on winter weekdays, especially in January and February, your own traveling companions could be the only other human visitors you'll see. 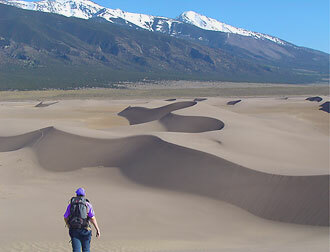 If you're ready for a healthy dose of solitude and natural beauty, consider a winter visit to Great Sand Dunes National Park and Preserve. But isn't it cold? Well, yes . . . at night it's often extremely cold. But daytime temperatures in January—the coldest month here—average about 35 degrees Fahrenheit. Cloudy days are rare, and the sunlight packs a terrific punch, even in mid-winter. So a winter day-hiker is likely to work up a sweat while exploring the dunes and will need water, sunscreen, dark glasses, and a wide-brimmed hat. Hot chocolate is optional, but hot coffee and tea can be found at the visitor center after your hike. The quiet of winter makes non-human visitors abundant and easier to spot. See mule deer browsing in the foothills, elk and pronghorn moving across the grasslands, pinyon jays and Clark’s nutcrackers chattering in the forest, and golden eagles flying overhead. Wild animals move a little closer to us in winter, taking back their territories from the summer crowds. 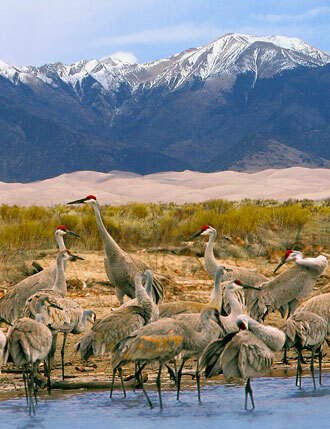 Push your off-season visit just a little closer to spring—say, early March—and you'll start to see migratory birds moving through the area, including thousands of sandhill cranes. So what do you need to know? 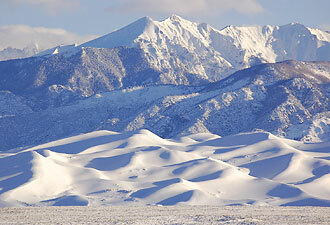 The main day use area of the park is located at 8,000 feet above sea level, in the San Luis Valley of Colorado. It's less than two hours by car east of Wolf Creek Ski Area, about two hours north of the ski area at Red River, New Mexico, and about two hours south of Monarch Mountain ski area. Maybe you're getting the idea now . . . The world-famous ski areas at Breckinridge, Copper Mountain, Vail, and Durango are just slightly farther away. Although any season is good for a visit, if you decide to take a break in mid-winter for a day at the Dunes, here's a promise: no lines, no crowds, just nature's handiwork and you!